The skills centre is now open! 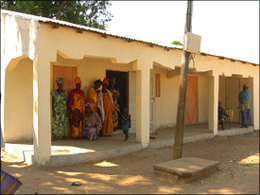 In April we spent two weeks in the village getting the skills centre up and running. We filled the storerooms with the supplies we had shipped out in March. We purchased large containers to store the wool and materials, and we filled up the shelving with all kinds of haberdashery, including buttons, beads, cottons, scissors, needles, elastic, braiding etc. There was great excitement for all of us as it started taking shape. Tables and benches were placed into both of the rooms where women of the village are now working. Lamin the local tailor and two ladies from the village played a significant part in helping with training during the second week of our stay. Sarah spent all of her time in the sewing room providing ideas and training, and Gloz took over the management of the other room to teach crochet, with the rest of us helping whenever we had time to spare. We had community meetings during our stay to finalise plans and the skills centre will be managed by the women themselves. As with the garden project we will still be in the background to assist if needed. There was so much enthusiasm and we were so thrilled to see that from the very first day there were bags, skirts and tops being made, and crocheted hats, mats and blankets taking shape. Everyone had a huge sense of satisfaction at the end of the first day, and everyone was eager to start again on the days that followed. There is a veranda running across the front of the building, with two large rooms and an office running off it. There is a storeroom for each of the workrooms built behind – with plenty more space to use – and an outside walled and paved area has been created at the back of the building with concrete seating ready to use for soap making. There are also toilets and a wash area. It is difficult to explain just how much this is appreciated, but to everyone who has played a part in raising funds, providing the supplies and also practical help with getting the workshop ready and providing training; a massive thankyou for making this project possible – it really will make a difference! 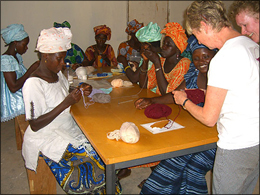 A visit to the skills centre in October this year showed that it is continuing very popular and productive, the ladies are selling some clothing that they are making. The crochet is also popular and we were shown some examples which were really well made. 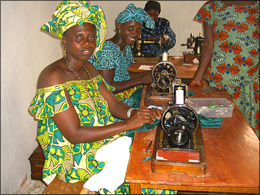 Two of the ladies had made clothing for both Sue and her husband Gwyn, which they wore proudly that evening when invited to a meal with the laboratory technician from Soma Hospital. We will be providing some extra work for the centre to make uniforms for the nursery schools we support. Supplies from March and August shipments have been distributed this year to Si-Kunda, Jiffen, and Toniataba nursery schools, Fonkoi Kunda and Toniataba junior schools, and to Pakalinding senior schools. Further computer equipment has been installed in April to the computer lab. This is hugely successful, and an internet cafe has been started to help with raising funds for fuel. April – Part of the school garden wall had collapsed which local animals took advantage of and completely destroyed the banana orchard. This is vital to the school with supplementing the school lunch prepared by women from the village. This wall is now in the process of being rebuilt, and help will be provided to start the orchard again. Buckets, watering cans and other essentials were supplied on our visit in April. September/October update – Supplies of 3,000 exercise books (we source these in Gambia) have now been delivered for the start of the school year, along with further supplies from the August shipment. Ansu the nursery teacher at this school has started nursery teacher training, and has passed the first part of the course. This course takes place during school holidays, and Ansu is already putting the skills he has learnt into practice. 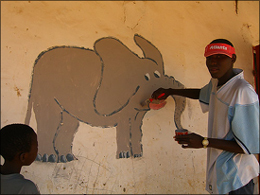 Along with repairs to this school, this training has been sponsored by Bletchley Rotary Club. Part of the roof had been damaged in the high winds in August, so this has now been repaired, also repairs have been made to the walls surrounding the vegetable gardens. 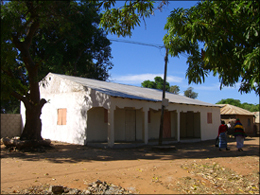 All the school fund fees are now sponsored in this school, which helps all the families of students attending this school. Supplies of 3,000 exercise books (we source these in Gambia) have now been delivered for the start of the school year, and further supplies from the March and August shipments. Another 500 exercise books will be delivered in January. We have a new headmaster starting October 13th, to improve the administration and teaching at this school. The facilities are now very good, and we are going to re-start the food programme at this school ourselves for the time being. This is necessary as the organisation that has in the past been supplying to the nursery schools that are unattached to a Lower Basic school, have now stopped supplies. Meanwhile there are steps to try and get this school affiliated to Toniataba Lower Basic. April: A large part of our March shipment went to both the hospital and the Red Cross. Including stethoscopes, dressings, surgical gloves, and much more. Chairs were also given to the Red Cross for their meetings, and they also rent them out to raise funds. September/October update – A large number of boxes of supplies were delivered from the August shipment to both the hospital and the Soma Red Cross. Also another wheelchair, we need more, and crutches! The hospital has been very busy with malaria cases, as is usual this time of the year. The hospital always needs more than we can provide, but all we do send really helps tremendously with their requirements. The Red Cross volunteers with whom we have a close association in this area, have been busier than usual out in the far reaching villages as there have been some extremely strong winds this year with very heavy rains destroying many homes and some of the crops. The volunteers do a tremendous job in very difficult conditions, with little or no transport covering a very large area (bicycles for those that have them), with few supplies. (However the rains have been good for the rice crops which have been poor in recent years.) We have given knitted blankets to be distributed to the most needy in this area. We have another visit to the area planned this year in December. Further updates will be provided then….